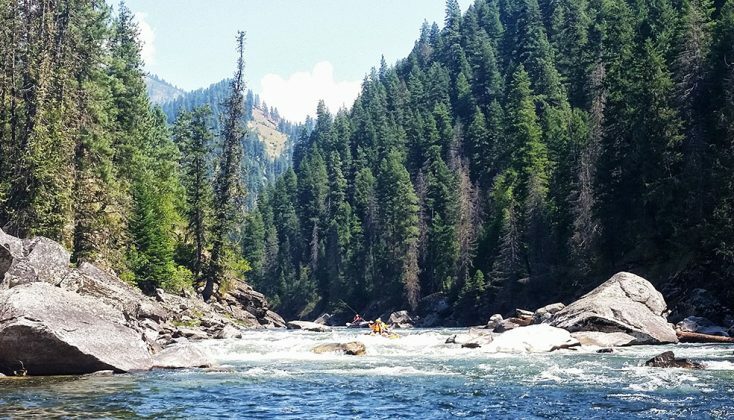 The Selway River Trip is a premier mountain wilderness, whitewater, camping, and fly fishing trip that flows through beautiful forested canyons. 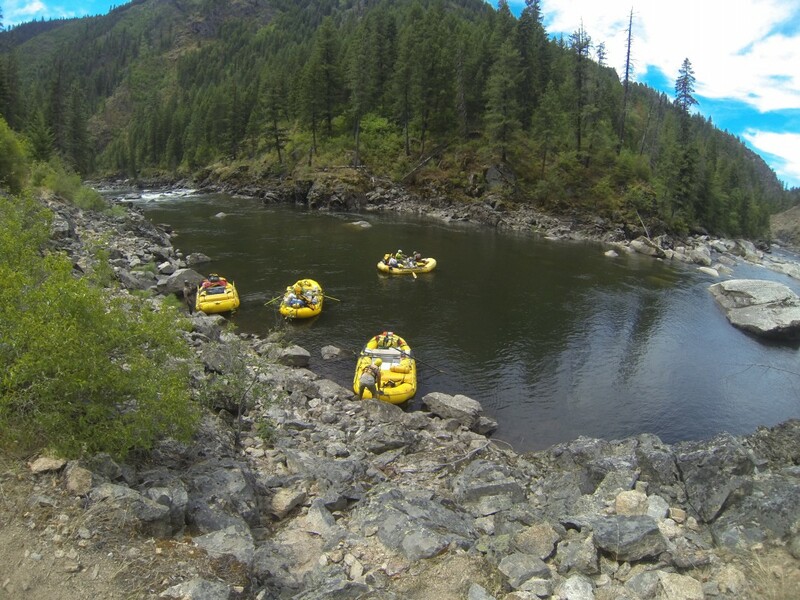 It is easy to consider the Selway to be the ultimate rafting trip. 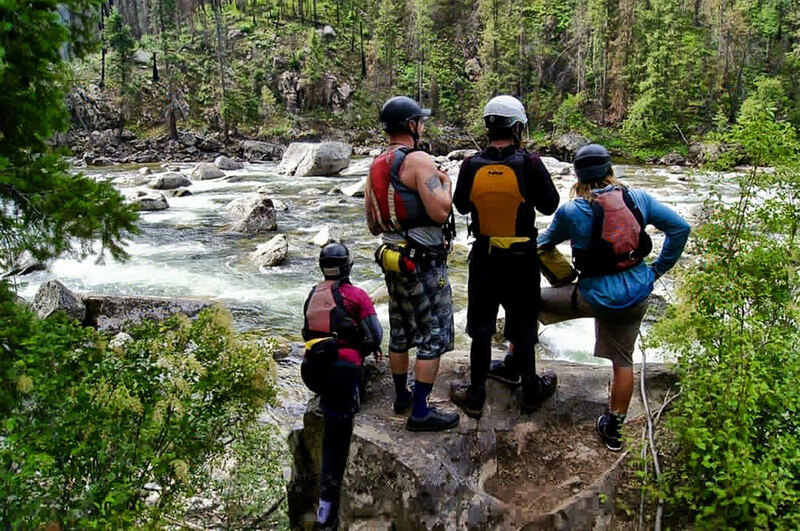 River banks are lined with Grand Fir, Douglas Fir, Cedar, Ponderosa Pine, Hemlock… Rapids are challenging, the area is remote, and the scenery and water quality are outstanding. For 47 river miles from Paradise launch site to take-out at Race Creek the river descends over 1300 feet for an average gradient of 28 feet per mile. There are countless tributary creeks, and the Selway’s volume grows quickly. At Mile 26.5 Moose Creek joins the Selway. Rapids that follow the confluence with Moose Creek are renown as “Moose Juice”. 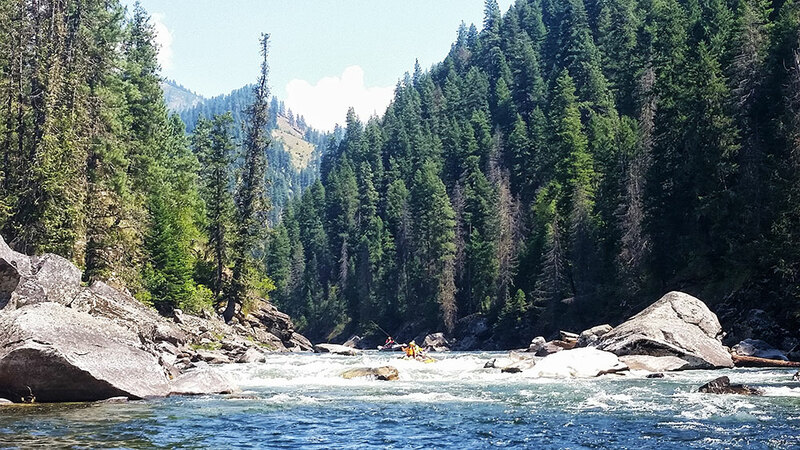 There are plenty of calm stretches, however, the Selway is a whitewater trip. There are 38 named rapids including the well-known Galloping Gertie, Washer Woman, Cougar Bluff, Ping Pong Alley, Goat Creek, Bear Creek, Rodeo, Pettibone, Dog Creek, Magpie, Ham, Tony Point, Divide, Double Drop, Grizzly Saddle, Ladle, Little Niagara, Puzzle Creek, No Slouch, Miranda Jane, Osprey, Tango, Wolf Cr, Jims Creek, Cupboard Creek, and more. Difficulty ranges from Class II to Class IV+. Goat Creek, Ham, Double Drop, Ladle & Wolf Creek are highlights. The trips are outfitted with self-bailing oar and paddle rafts. Blue ribbon fly fishing for wild Westslope Cutthroat Trout. Catch and release regulations with single barbless hooks on both the Selway and tributaries. Check with the Hughes Office for details. Your trip will encounter few if any other river runners. Selway River Management by the Bitterroot National Forest limits use to a single launch per day. There are only four outfitters permitted for the river. We are privileged to be one of the four. Group size is limited to 16 total people, including guides. Check with the Hughes Office for details. Camps are incredible. Many among the best in the West. A river trail and side trails offer hiking opportunities. Wildlife includes elk, mule deer, black bear, cougar, otter, beaver, mink, osprey, eagles, and a variety of song birds. 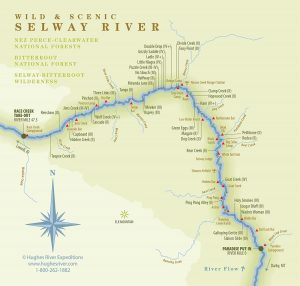 The Selway River along with the Middle Fork of the Salmon were protected as members of the “original eight” National Wild and Scenic Rivers. On the Selway we float inside the vast Selway-Bitterroot Wilderness (1.3 million acres, 2,094 square miles). Special Use permit by West Fork Ranger District, Bitterroot National Forest. The Selway River trip travels through the Bitterroot NF and the Nez Perce-Clearwater NF. The Selway-Bitterroot and Frank Church Wilderness Areas are practically contiguous, barely separated by a 95 mile rugged winding gravel road called the Magruder Corridor. The Frank Church – River of No Return Wilderness totals 2.36 million acres and 3,698 square miles. Together the Selway-Bitterroot and Frank Church total 3.66 million acres and an astonishing 5,792 square miles. 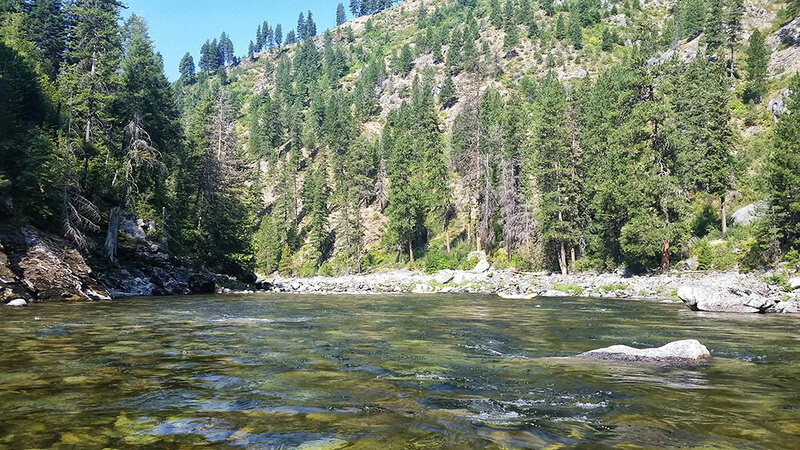 Idaho’s incredible Wild & Scenic Selway and Middle Fork Salmon are America’s premier wilderness rivers. 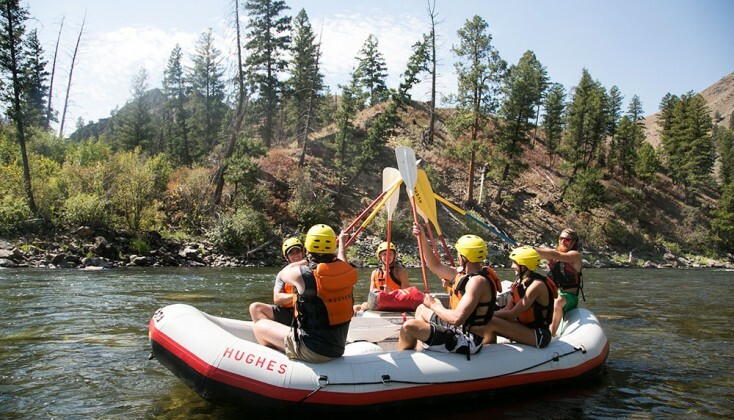 Hughes River Expeditions, Inc. is one of only two river companies to hold Special Use Permits to outfit rafting trips on both the Selway River and the Middle Fork Salmon. 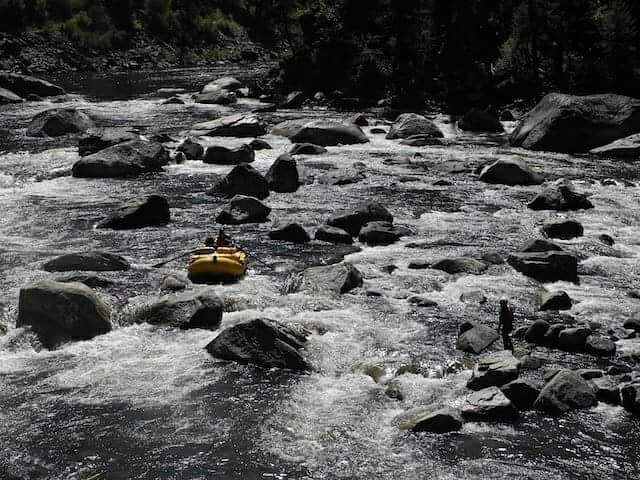 We are convinced they are the best wilderness rivers in the USA. We take this opportunity seriously. 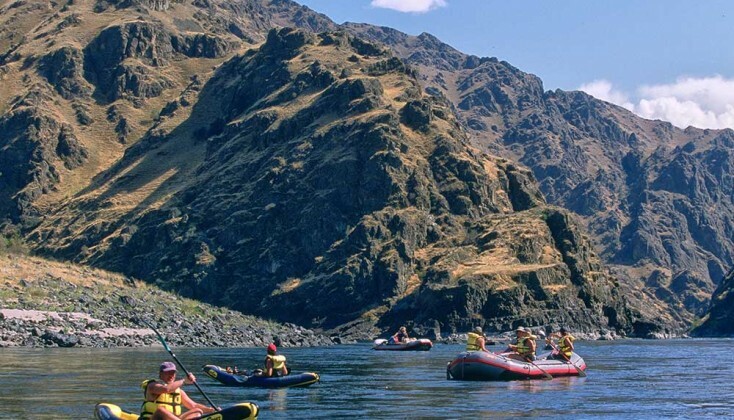 We have always prided ourselves on running first-class trips on some of the best rivers in America! The Selway River is certainly one of the very best. We feel incredibly fortunate to be one of only four companies operating on this amazing resource. What separates us from our competition is guest/guide ratio. Historically the Selway has been operated with 12 guest/4 guide/trip. HRE will begin running 10 guests/6 guides on our June 18th and July 25th launch dates and 11 guests/5 guides on our June 26th & July 14th launch dates. This guest to guide ratio adds an extra level of support for our guests & guides by adding the ability to have a safety hard shell kayak in high water and by expanding our “safety-net” with an additional boat or two in average-low water. This will help ensure HRE will have the resources to adapt to the widest range of flows. It will also add comfort for our guests by having additional guides to help with camp set-up, breakdown, cooking, guided hikes, and other activities. This institution is operated under special use permit with the Bitterroot National Forest. This institution is an equal opportunity provider. I’d like to thank you and your entire team on a wonderful Idaho experience that only “Hughes” can provide. It’s an extraordinary place and I feel more than satisfied that we’ve seen something special and unique. Thank you so much for organizing our trip. It went wonderfully!! I swear I feel like it was the best one ever. Put us down for 3rd week June 2007! Just a quick note to let you know that we had a wonderful trip. The most important factor was the quality of your guides…We will see you again.